I love a great coffee cake. Thanks for the recipes and the topping options. Always find a wonderful recipe here. Thanks for sharing this wonderful simple coffee cake recipe. This sounds like one of my favorites from childhood. I'll try it. I like the apple variation! Oh my...it looks like you raided my mom's recipe file,lol! I love this kind of cake and grew up with it all my life. Does it mean anything that I'm Lithuanian/Canadian as well??? 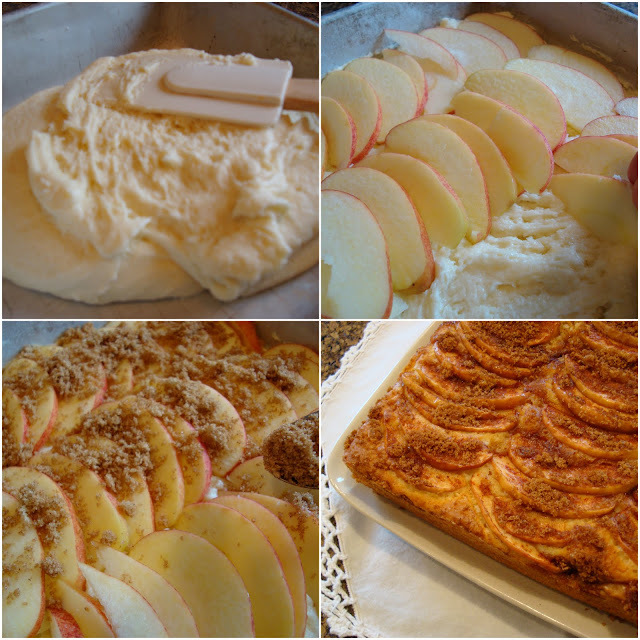 Thanks for sharing the recipe...I just LOVE your blog! All weekend I surveyed cookbooks for just the right apple cake, rejecting one after another for being too sweet, too rich, too fiddley...only to log in here and ... there it is! mmm... That looks really good but simple! I will have to try that, my hubby loves to have something to snack on, I think he will like this one! Thanks for sharing. I love coffee cake! Thanks for sharing :). This is a perfect recipe - simple, elegant, and versatile. Thanks for sharing this! What a perfect little coffee cake. I will sure be making this next time I have salesmen stopping in for coffee. Yes, sometimes simple is best. I have been looking for a simple, delicious coffeecake for a while, and I believe I have found the "one." I made this little cake today. Don't know what I was thinking but I put the apples/sugar/cinnamon on the bottom then the cake batter on top. This will be my go-to cake when I want something quick for unexpected company, or to take to hospital or visiting. Thanks for this. More like it? Economical, simple, few on-hand ingredients but delicious. Oh. I did also add vanilla to the batter. I love vanilla. I also added vanilla, chopped pecans and cinnamon to the batter as well as flour to the streusel topping. It came out delicious. Just right to make before breakfast and to enjoy right from the oven!